Here’s a compilation list of our choices for the Best Jazz Albums of 2013 from our three prior Best of the Year posts. A click on the links in each title will take you to the Amazon or CD Baby page for each album (a great way to spend those gift cards you may have gotten from Santa). From Best Jazz of 2013 – A Few More Good Things; Plus! Tracks from all of the albums listed here will be featured on Curt’s Café Noir WebJazz Radio, starting on December 27, 2013 and into January 2014 as part of our Year End / New Year programming. Click HERE to go to the station and listen. It’s Free! May you all have a happy, prosperous and jazz filled 2014! Best Jazz of 2013 – A Few More Good Things, Plus! I tried to cut off my Best Albums list at 20 but there are a few more that I feel that you must know about if you don’t already. Plus as usual, during the year, I discovered a few outstanding albums that were released in 2012, that I didn’t hear until sometime in 2013. An extremely impressive debut album from this Seattle-based singer. Even more impressive is that she wrote most of the songs on this set. Ms. Jones possesses a finely tuned lyrical wit and she sings like a grown woman who knows what she is talking about. We expect to hear a lot more from her. The follow-up to the Grammy Winning Black Radio, is an all vocal affair with more strong R&B laced tunes and more terrific guest stars to sing them. A minor quibble – I would have liked to hear RG step out and solo a bit more but it doesn’t change the fact that this is another winning album. The best Latin Jazz trombonist working today does it again, with another strong album. East coast people, WAKE UP! and check this cat out. But I’m not the only one who has noticed, as the album has copped a 2014 “Best Latin Jazz Album” Grammy nomination. Read my full review for Jazz Inside Magazine HERE. I’ve always considered Wallace Roney to be an incredibly gifted trumpet player. However, he has wandered a bit in the wilderness on his recordings over the last decade. Thankfully he has ditched the electronics that never really served him well, hooked up with a quartet of talented and hungry young players and found his musical footing again. It’s his best record of the 21st Century. Welcome Home, Wallace. What doesn’t Willie Jones III do well? He’s one of the best drummers in jazz today, he runs maybe the best small label in jazz, WJ3 Records, which has dropped three albums on our “Best Of” list this year in addition to a few in years past and he also records under his own name for his label turning out a first-rate tribute to the legendary Max Roach. Jones, with support from Eric Reed, Jeremy Pelt, Stacy Dillard and others has made an album that doesn’t feel like a tribute but like a bunch of top flight cats just swinging their asses off. And I mean that as a compliment of the highest order. And then, there are always albums from the previous year that due to release date, spotty promotion or other assorted reasons; I miss until the next year. But some are so good that I would feel bad if I didn’t tell you about them. Renée Yoxon is a young and incredibly talented jazz singer who hails from Canada. On Here We Go Again, her second album, she teams up with veteran Ottawa pianist Mark Ferguson to create an album of original compositions that are so good that they should be standards. And that singular voice… It’s youthfully fresh but with mature soul. Either we have to get Renée to come south to perform more often in the U.S. or we’ll just move up north to hear her. He first came to public attention as a member of the Harper Brothers group during the “Young Lions” craze of the early ‘90’s and he has certainly paid his dues as a sideman over the years, working with other “lions” such as Stephen Scott and Roy Hargrove. On this, his third album as a leader, the alto saxophonist turns in his strongest work to date under the production wing of drummer Willie Jones III. Veterans Larry Willis, Dwayne Burno and Hargrove himself join in to get things smokin’. This project flew under the radar but you should catch it while you can. Ed Cherry is a veteran guitarist who spent ten years with Dizzy Gillespie during the legend’s twilight. He has released a number of projects since then, always swinging hard and playing impeccable lines. I missed It’s All Good in 2012 but I’ve been making up for it ever since. It hasn’t left my CD Jukebox over the past eight months. When you hear it you’ll understand why. Pianist Shamie Royston is the sister of saxophonist Tia Fuller. Ms. Fuller has garnered much attention for her work as a solo artist in the jazz world (Ms. Royston is her pianist) and in the pop world as the sax player in superstar Beyonce’s touring group. Portraits is Ms. Royston’s debut album as a leader and she shows that she deserves to come out of her sister’s shadow. Her compositions are compelling and her playing is consistently interesting. She swings hard with a touch of Horace Silver in her sound. Ms. Royston is definitely an artist that deserves wider recognition. This finally concludes our look at the Best Jazz Albums of 2013. The albums in this post and in the two prior ones will be featured on Curt’s Café Noir WebJazz Radio, starting on December 27, 2013 and into January 2014 as part of our Year End / New Year programming. Click HERE to go to the station and listen. It’s Free! This has been a year of many challenges for me and I thank all of you who have stuck with me through them all, via Twitter, Facebook, this blog and in person. I pray that 2014 will be a great year for us all. Until the next time, I wish all of you and those you love a very Merry Christmas, a belated Happy Chanukah, a glorious Kwanzaa and a healthy and prosperous New Year. As always…The Jazz Continues! Born in Pittsburgh, Mr. Affif was a student of the great Joe Pass and the son of a well-respected middleweight boxer, who passed along to his son his love of jazz. Mr. Affif, who now calls Brooklyn home, released five strong albums for Pablo Records during the ’90’s. My personal favorites are Ringside and 52nd Street. Most times he works in the trio (guitar, bass, drums) format, which leaves ample room for his creativity. He still presides over Monday nights at the Zinc Bar in Greenwich Village; as good a reason as any to check it out. Another Pittsburgh native (there must be something in the water there that produces great jazz guitarists), Ms. Bailey constantly finds herself being compared to Emily Remler, the patron saint of female jazz guitarists. To take nothing away from the late Ms. Remler, of whom I’m also a fan (as is Ms. Bailey), I think that Ms. Bailey is better. For my money Sheryl has a slightly better sense of swing and a warmer tone but why quibble, just love them both. Her last two albums A New Promise and For All Those Living have been on Curt’s Cafe’s Best Jazz Albums lists in their respective release years. According to her website, Ms. Bailey has a new trio album coming out soon. Be on the lookout! Born in Israel and now based in New Jersey, Roni Ben-Hur fell in love with the recordings of Wes Montgomery, Grant Green Kenny Burrell and Jim Hall at a young age. He was also a fan of the great classical guitarist Andres Segovia. After moving to New York in the mid ’80’s, Mr. Ben-Hur was exposed to the music of Baden Powell, the great Brazilian guitarist. Having all of those influences turned Ben-Hur into a musician with a sound that is strikingly lyrical, yet he swings as hard as anyone on the scene today. In New York Ben-Hur came under the tutelage of the great bop pianist Barry Harris, learning many priceless musical lessons during his time in Harris’ band. He is passing on what he has learned through jazz camps that Ben-Hur and his wife, vocalist Amy London, conduct around the world. Though his recorded work has been uniformly excellent, I recommend 2007’s Keepin’ It Open and 2012’s Our Thing, with Duduka Da Fonseca and Santi Debriano as the best of the best. 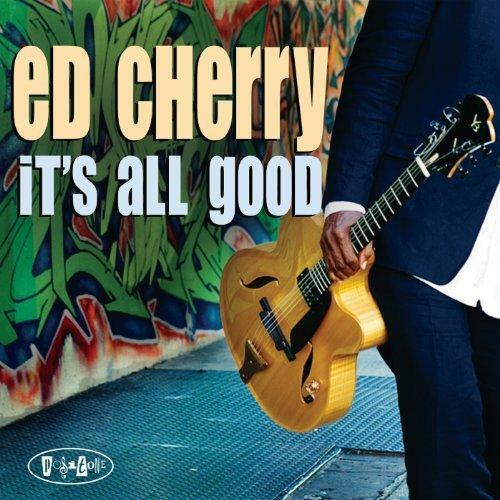 Musicians dig Ed Cherry. It’s time for the public to join in on the praise. This New Haven native first garnered attention during the decade-plus that he spent with Dizzy Gillespie, performing in the legend’s small group and big bands. Mr. Cherry then struck out on his own releasing his first recoding as leader, First Take in 1993. Over the last twenty years, Cherry has lent his blues drenched sound to albums by Big John Patton, Henry Threadgill, Paquito D’Rivera, Hamiet Bluiett and many others. Whatever he plays, Cherry’s lines are clean and soulful, with a sound that makes you give up that audible “Yeah!”. HIs third date as a leader, 2001’s The Spirits Speak, on Justin Time and his most recent, 2012’s It’s All Good on Posi-Tone are still in print and available. Get them while you can. As always, we encourage you to support the music of any of the artists that you like in this post by buying their CDs or legal digital downloads. Or even better if they come to your area, go out and see them live and then buy their music.